One of the only legs biotech has had to stand on is Monsanto’s shill scientific studies and political bullying. 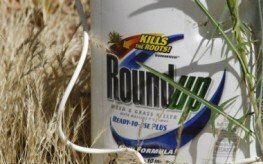 The latest independent study from the Arctic University of Norway has detected “extreme levels” of the biotech giant’s RoundUp herbicide in our food, proving that the agricultural herbicide manufactured by Monsanto has utterly changed our food supply. And it is anything but safe, no matter the propaganda churned out by oligarchic companies. While Big Ag keeps telling the world that GM food is no different than real food, it becomes exceedingly clear that this is utterly false. They use this lie to pass their GM crops through regulatory agencies, using what is called the ‘substantial equivalence’ argument. This, despite the fact that other studies have already proven that there are ‘anti-nutrients’ in GM food. The Norwegian study, coming out in June’s issue of Food Chemistry, and available online, looked at 31 different soybean plants on Iowa farms and compared the accumulation of pesticides and herbicides on plants in three categories: 1) genetically engineered “RoundUp Ready” soy, 2) conventionally produced soy (meaning not GM soy), and 3) organic soy. The researchers found high levels of RoundUp on 70 percent of genetically engineered soy plants. This should come as no huge surprise since GM soy was, in fact, engineered to withstand industrial strength spraying of RoundUp chemicals so that farmers could eradicate weeds. What happened was that all this spraying created super-weeds, which made farmers spray even more RoundUp chemicals, leading to further increased toxicity. What you end up with is a crop Armageddon, with even the super weeds becoming resistant to biotech’s favorite poison. Now, we have crops that are so saturated with RoundUp, we may as well just drink it straight from the bottle (don’t do that!). Even Monsanto has admitted that RoundUp contamination can be ‘extreme.’ If a plant’s total weight contains 5.6 milligrams per kilogram of herbicide, it is considered to have an ‘extreme level’ of contamination. Can you guess how much RoundUp was found in soy plants by the Norwegian scientists? It is an astonishing scientific find – an incredible 9 milligrams of RoundUp per kilogram on average were detected in GM soy. The next time you eat anything – and I mean anything containing GM soy – that means you are essentially wolfing down a big dose of cancer-causing, reproductive failure-instituting, organ-failure-forcing RoundUp. It’s rather unfortunate.